It was going to be the cold snap of the century, hurricane force winds, six feet of snow, floods and a dust storm all rolled into one. But friends Jody and Adam and I left Seattle for a weekend of I'm not exactly sure what in Cle Elum Saturday morning anyway. In the end, the biggest adversity was a broken snowshoe. Under sunny skies, we arrived at our cabin in Cle Elum a little after noon. The outside temperature was 7 degrees, the inside temperature was about 8. Jody made a fire while Adam and I shoveled the driveway. We drove the car in next to the house, unloaded our gear and tried to get warm. We screwed around for a little bit, turning on various heaters and thawing out the water pipes. In about half an hour, we were off to Ellensburg where we had a nice lunch at the Dakota Cafe. Light snow began to fall, then heavier as we walked the downtown area. A little shopping at the local outdoor shop, a quick tour of the town's quirky museum and it was beginning to get dark. 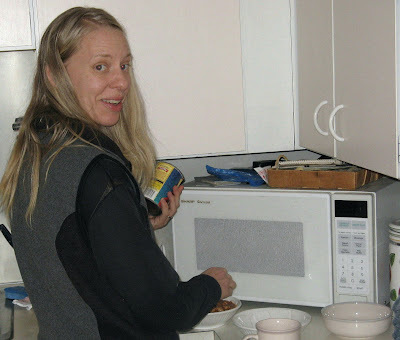 We drove back to the cabin on the canyon road, found the house pleasantly not on fire, and shortly after arriving, left again for Roslyn to find some dinner. Much to our dismay, Village Pizza inexplicably was closed for "Christmas Vacation" so we back-tracked into Cle Elum where we had a nice dinner at a new restaurant on Main St called "Beau's". We walked around in a fairly heavy snowfall that didn't quite make it to the predicted blizzard status and headed back to the house where we watched a lame Charlie Chaplin movie (The Gold Rush) and watched weather reports of impending doom that we all knew would never materialize. It should also be noted that a little earlier we parked next to the Timberline Motel, poached their wifi for a few minutes while Adam and I made adjustments to our virtual sailboat race on my laptop computer in the front seat of the car. The snow continued, the car radio said the pass was closed and not expected to open to Sunday afternoon, "at the earliest." Somehow, it just didn't seem like a real storm was imminent. We bailed on our idea of taking a sauna as the downstairs water had still not thawed. A little after midnight, I headed up to the unheated attic and had a very cozy and sound sleep in Tiana's old bed, with the window cracked open just a little. Next morning, we made breakfast and went on a nice hike behind the house as we waited for the pass to open. One of my barely used snowshoes broke, Adam fixed it with a spare shoelace. I'm afraid he will now be know as "MacGruber" based on the SNL skit of the same name. While hiking, we learned that the pass had opened and we headed back to the house, postholing every step of the way in 2+ feet of powder. We watched a bit of the Seahawks game, had a bite to eat, jumped in the car and made an uneventful passage back to Seattle, stopping by briefly at Adams' parents houseboat next to the CSR yard on Lake Union. While we were gone, indeed a fair amount of snow had fallen and was still falling in Seattle, but the storm totally failed to reach expectations, as is typical of most hyped-up weather events.